At the moment of course yes, because only a positive outcome makes a mountain trip a good one. And Gerry’s death was the worst thing that could happen. Alex and I are trying to recall especially the ascent, when Gerry was still well. The line through the wall and the climbing was really outstanding. Let’s first talk about this ascent. How were the conditions in the wall and which difficulties you had to overcome? From the distance, the South Face looks as if it is free from ice, but inside there is a lot of so-called “black ice”. 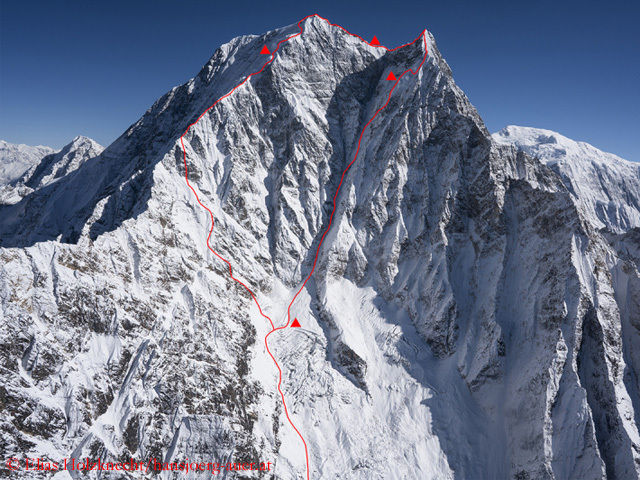 We have chosen our route in the right part of the wall, which is actually a shady West Face in the South Face. Therefore, there was a lot of ice and it was a very steep climb – much harder than for instance on Khunyang Chhish East. 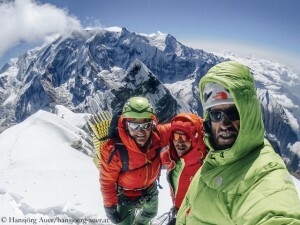 [In 2013, Hansjoerg succeeded in first climbing the 7,400-meter-high mountain in the Karakorum, along with his brother Matthias and the Swiss Simon Anthamatten.] 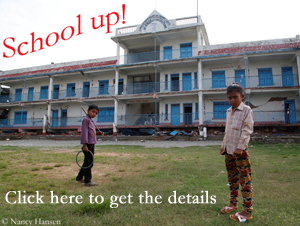 The first day was tough. We didn’t find a suitable place for bivouacking below 6,500 meters, so we crept into our bivouac sacks not until 5 p.m. On the second day, we climbed an about 6,780-meter-high spire, which was higher than we had suspected. Then we had to cross a very exposed, steep ridge, partly abseiling. After another bivouac we reached the top of Nilgiri South, after a relatively short, technically not too difficult climb. The descent via the Southwest Ridge was more difficult than we had expected. It’s always difficult when you have to break the golden rule on high mountains to descend on the same route you climbed up before. But on Nilgiri South it was not possible because the ascent was too difficult. In addition, in the lower parts of the wall the risk of rock fall was so high that we didn’t want to expose ourselves to this danger a second time. You had to bivouac three times during the ascent. 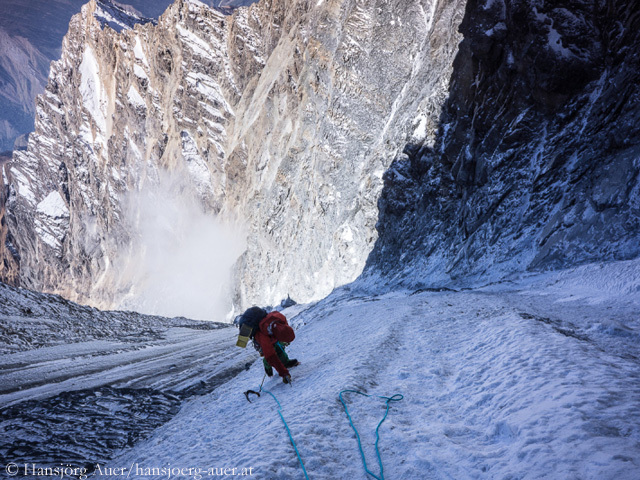 Were you on your last legs when you reached the summit? Alex and I felt good. On the first day, we were all on our limits, but the other two days of ascent did not take such a long time. But in the end everything revolved around Gerry. We tried to find a way so that it was possible for him in his state of health. On the summit, Gerry was suddenly in very poor health. Were you then already aware that he was probably suffering from high altitude sickness? 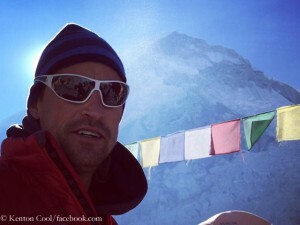 In the morning of the summit day we noticed for the first time that something was wrong with him. At first we thought he was just exhausted. There were only about 200 meters in altitude left. We hoped that the euphoria of the summit success would help him and that we could then descend as quickly as possible on the other side. Gerry was an excellent mountaineer and climber, but that was no longer the powerful Gerry, as we knew him. We had to bivouac again at 6,500 meters. You then tried to organize a rescue by helicopter. What was the problem? 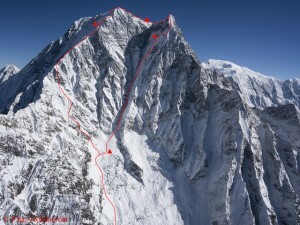 On the summit day, the wind speed was 45 kilometers per hour, the day after 70 km/h. In addition, it was very, very cold. Under these conditions, a rescue on such an exposed ridge was simply impossible. After the bivouac you continued the descent. How did the accident happen? At night it was really bad. We tried our best to help Gerry, we realized that it would become very close. The next morning Gerry felt okay and we continued our descent on the steep, icy ridge. We could not just abseil but had to climb down the ridge. At a supposedly easy point he fell into depth. In retrospect, it’s almost astonishing that Gerry in his poor health managed to climb down from nearly 7,000 to about 6,000 meters. I think that was due his great performance and ambition. Why wasn’t Gerry roped up? We were climbing in Alpine style, which also means reducing equipment. Then you’re used to go without rope in easier terrain, so that you get ahead faster. If you rope up in a group of three, you have to secure everything. 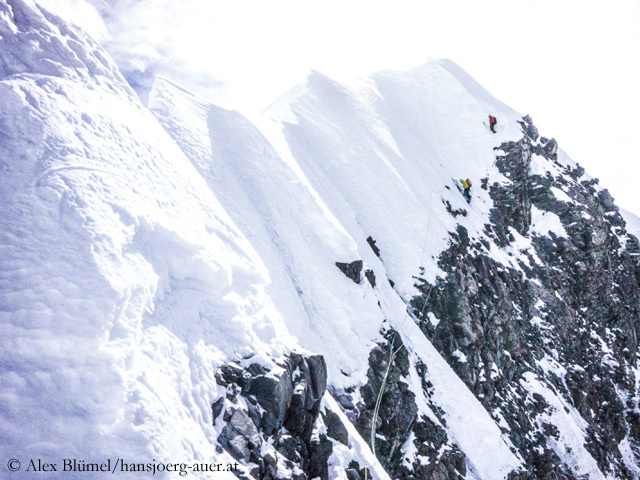 On the Southwest Ridge of Nilgiri South you can’t walk with a short rope as you do in the Alps. Did you immediately know that Gerry could not have survived the fall? Yes. But in the beginning you don’t want to believe it. You sit down and don’t know what to do. You cry, walk another hundred meters, sit down again and cry once more. You probably will not understand it for the rest of your life but you try to accept it. The risk is part of our sport. Do you believe that the disaster will change your own risk-taking? I don’ think so. In recent years I have intensively dealt with the theme of danger. You just have to, if you climb even free solo as I do, for instance this year on Heiligkreuzkofel. [On this mountain in the Dolomites Hansjoerg climbed the difficult route “Mephisto” for the first time solo and without rope.] Of course, I can’t simply carry on with the agenda. Gerry was a good friend, I miss him. But I hope it will get better with time. My passion for climbing is just so strong that I’ll go on expedition again. One of the world's most famous base jumpers is dead. 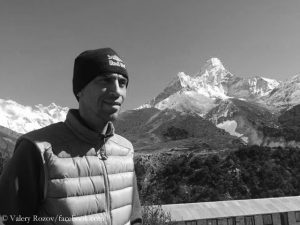 Russian media report that Valery Rozov was killed in a wingsuit flight from the 6,814-meter-high Ama Dablam near Mount Everest. The exact circumstances are not yet known. Anyone who has ever climbed a very high mountain knows about the dangers during the descent. Not the dangers of the mountain itself, but of your own body. Suddenly all adrenaline is used up, you feel the pain that you have pushed away during the ascent, you are exhausted, only want to get down quickly and run into danger of losing your concentration.